Privacy filters appear most frequently in the screens of ATMs and cash registers, and there are a few laptop PCs that come with a stick-on filter that prevents side-on viewing. However, the roaring popularity of the technology in cellphones in Japan may have prompted NEC LCD Technologies to address the quality issue. 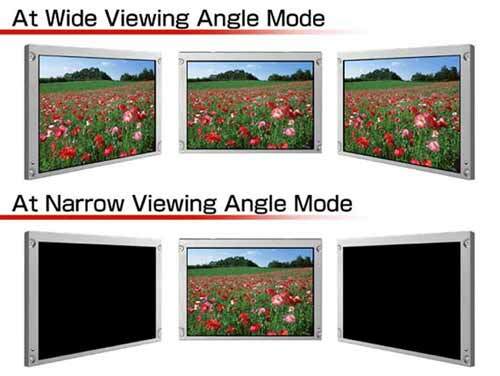 The company’s new displays can not only switch between wide and narrow viewing angles, but can also do so without affecting the brightness or sharpness of the image. This is possible thanks to a polarizing plate at the back of the new panel that disperses light across either 140 degrees or 30 degrees. Older methods control the angle using a filter at the front of the screen, which seriously impacts the picture. For now, the angle has to be set during manufacturing and there are only two possible fields of vision, but NEC hopes to develop the technology to be more flexible in future. The days of having to bend your knees and squint to use a cash machine and of nosy-parkers on trains peering at your laptop may be over by as soon as 2008.